How are you staying active and varying your movement? I don’t know where you live, but here in Columbus, where the Mudlife Crisis family lives, it’s cold and snowy. My wife, who’s originally from Texas, has accustomed herself to the cold to a point where she’s just happy to see temperatures in the positive column. So that’s saying something. Our sidewalks are pretty covered with snow, no doubt. And for whatever reason, <curmudgeon>people don’t clear their own walks like they used to</curmudgeon>, so it can be pretty tricky to get around sometimes. You see a lot of people walking in the street because of that. So today’s tip is to ignore all that, and LOOK for the hard way to do things. Huh? That’s ridiculous, right? I mean, who’d look for the difficult terrain when there’s a nice level street out there to walk in. Besides, I’m listening to music on my phone and I don’t want to be bothered to have to look for ice on the sidewalk, I’m trying to get through this walk because I’m burning calories and just want to get it over with. I’m going to give you a few reasons to stop doing this sort of thing – looking for the easy, “more efficient” way to do stuff, that is. 1. I’m going to throw out a concept here that I like to call “reverse acclimatization.” Any time we find that our bodies can handle something, like extreme temperatures (cold or hot), or uneven terrain, or eating whatever food we can find at the time, even if that means eating 500 different species of plants and animals during a month; that generally means that not only can we handle it, but our bodies have come to expect it. And if they expect something, they’re probably not going to handle it well if they don’t get it. So let’s say that we did eat 500 different species of plants and animals in a month on average. Doesn’t it stand to reason that if our bodies learned to process those foods that they’d figure out good ways to use them? And if our bodies figured out good ways to use them, then it also stands to reason that there are tons of nutrients that we are getting from all those plants that give us optimal health. Same goes for movement – as we talked about in our post “You’re Never Too Old To Mud It Up”, we keep our mobility simply by keeping mobile. 2. Paying attention. Just as our bodies expect diverse foods and terrain and such, our minds expect to be challenged on a regular basis. That’s how they remain sharp. 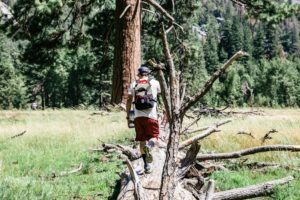 We spent tons of time keeping one eye on the trail and one eye on the environment around us just to survive – and again, using our “reverse acclimatization” model, what our bodies did out of necessity, they came to expect. That’s why you hear people talking about learning languages, doing puzzles, reading a lot, and more as ways to keep our minds sharp. And paying attention to the environment around us when we’re walking, etc. is simply another way to engage that mind (and one that is frequently lost in our manically-safe environment of today). For more on this, I recommend checking out the work of Stephen Jepson. He’s a former pottery professor and business man who has taken his life to the next level by promoting his idea of “Never leave the playground” and continually challenging the body and mind with new stuff. And he’s a hoot, for that matter. 3. Extra activity is great for just getting the kinks out throughout the day and keeping ourselves supple and loose. Example: I have stopped using the elevators at work. I work on the eighth floor of our building, and I get a good deal of movement just getting to my office, down to the basement to our deli/break area, and more. Combining that with my standing desk gives me a good deal of activity throughout the day. Another example: I recently posted about getting exercise at work. This has helped move my body in ways I don’t normally get, which keeps it from stiffening up and increasing the probability of injury. The key thing to remember in all of this: much of the stiffness and lack of movement we encounter as we age is frequently chalked up to just “getting old.” And as we pointed out in the “Never Too Old To Mud It Up” post, that’s a load of bunk. If we look for opportunities to move our bodies in different ways and pay attention to what we’re doing and what’s in our environment, we can overcome a lot of the problems of aging. What’s really hurting us is doing the same things over and over and trying to be too ergonomically correct in our movement patterns. Vary your movement throughout the day. Don’t fall into the trap of reducing your load or trying to optimize too much. That extra movement is good for you and what your body expects. ← Do You Exercise At Work?